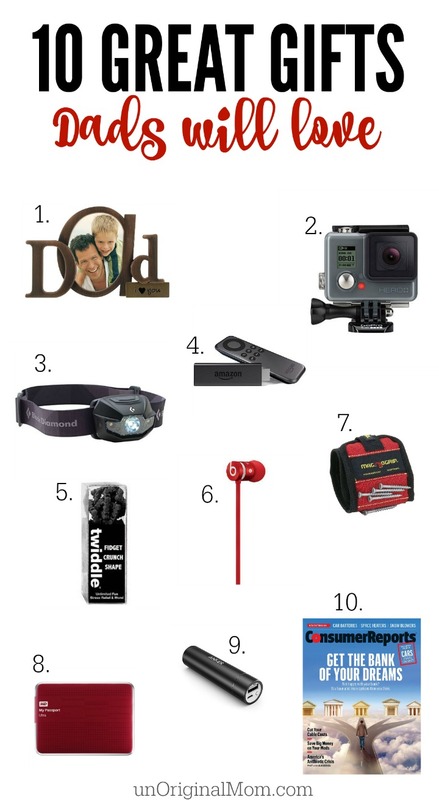 So, while I’m not a gift-giving expert on “great gifts for dad,” I do have a list of ideas that might help get you started. This is a list of affordable, quality gifts for all kinds of dads that I’m hopeful will help you to find a great gift for your husband or father this year! 1. Dad Photo Frame. I know, this gift idea gets beaten to death for dads. But I don’t think you’d find a Dad that wouldn’t be thrilled to get a (tasteful) Dad photo frame complete with an up-to-date photo of his kiddos. If you’re looking to be more creative, go buy a large wooden letter “D” and a letter “A” from the craft store and hold a mini photo shoot with your kid(s). Take pictures of them holding the letters, print them, and put them in a 3-print-wide desktop photo frame like this one. 2. GoPro. If you’re looking for a bigger gift, here’s an amazing one that Dad will LOVE – his very own GoPro video camera. These cameras record in amazing quality and I know he’d love to find this “toy” under the tree. 3. A headlamp. I bought this for my husband for his birthday and he uses it all. the. time. He wears it to take the dog out, when he’s working on the car, when he’s working in his shop, when he was getting Christmas boxes out of the attic…this little thing has been quite possibly the most used gift I’ve ever gotten him. It may not be very glamorous, but it’s super functional! 4. Amazon Fire TV Stick. We have two of these at our house and LOVE them. It plugs into an HDMI port on your TV and acts as your “base” for running all different kinds of apps – Netflix, Amazon Prime streaming video, Sling, Watch ESPN, Pandora, and tons more. It has essentially the same basic functionality as a Roku or Apple TV at a much lower price point. 5. Desk Puzzles and Toys. For dads that have office jobs, little desk puzzles/toys or even brain teaser puzzles are good stocking stuffers. 6. Ear buds. Time to upgrade the cheap-o ear buds that came with his ipod? Get him a nice pair of ear bud headphones. 7. Magnetic Wristband. What a clever idea! No more “where did I put that screw down?” I can see this being useful for the super-handyman and the not-so-handyman alike. 8. External Hard Drive. Is your husband/dad the default tech support in his house? He’ll appreciate having some extra file storage space for file back-ups or family photos, videos, and important documents. BONUS IDEA: Give him a subscription to Amazon Prime! There’s so much more to a membership besides just free shipping (we LOVE Amazon streaming and use it to watch some of our favorite shows!) – I guarantee he’d love it. Don’t you love Christmas shopping from your couch?? Good little girls … all I’ve ever wanted. Good thing you’re getting that for Christmas again this year.